Why does marketing fail so often and how can we do better? Marketing research sellers and buyers…why are you not growing? As reported in Ad Age, Amazon doubled their ad revenues vs. last year, achieving their first $2 Billion quarter! The sea change I predicted last summer is happening… Amazon is competing with Facebook and Google for ad revenues, offering similar capabilities (search, segment creation, targeting platforms, off site/open web ad placement.) 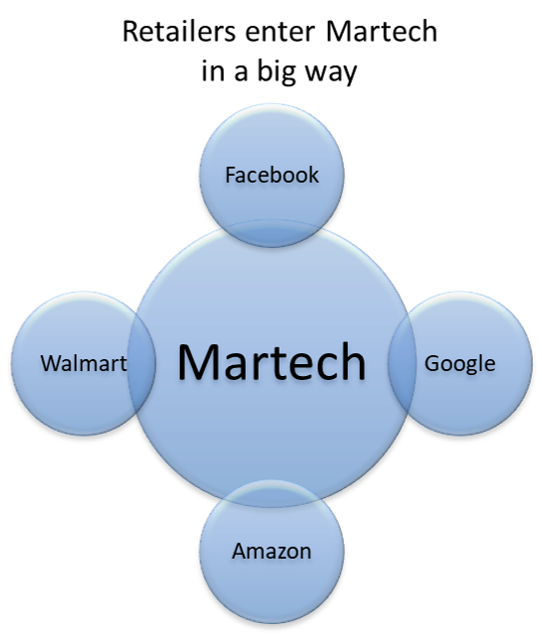 As big retailers become Martech companies a new media channel will emerge; retailers as Martech (RaM). And this emerging channel is significant: Amazon (and other RaM players) could account for 10-20% of marketers’ digital ad budgets within 3-5 years. In my blog from August, 2017 I enumerated 7 reasons why I predicted RaM would be transformative. By converging shopper marketing and brand marketing, it promises superior advertising ROI across desktop and mobile by targeting intentions and preferences based on behavioral signals from shopper activity and market baskets. Retailing is just how they happen to come by their targeting data and unified IDs across devices…and it’s a REALLY good way to do it…as powerful as social media or search and gmail. So dear marketer, do you have your Amazon strategy in place, integrating advertising and e-tailing all at once? And dear marketer-side research and analytics professionals…are you creating a learning plan to inform the Amazon strategy and learn about other RaM? More product search starts on Amazon than on Google. Amazon can serve ads off their site throughout the web which still leverage their behavior-based targeting. Amazon also offers video advertising so do not assume that Amazon is only about performance…it can help brand-building too. From there, understand all of their ad products for both onsite and off-site (across the open web) placement. Other retailers are becoming RaM too. Walmart is reported to be very serious about its ad platform and programmatic offerings…AND Walmart has both offline AND online shopper data on which to define behavior segments. In fact, Walmart will require its own plan. Conduct path to purchase research. For your category, quantify the role of Amazon and the influence of online in general on your shopper journeys. I have designed such research for AOL on the “always on” shopper and you will be very surprised how people shop and how brands are built. Phase II…how well does advertising via RaM work? Validate segments. Amazon segments are based on actual purchasing and shopping behavior. However, not everyone does all of their shopping activities on Amazon. You will need to use surveys to cross-validate. I have entered into a business called Jolt! to conduct such research and so far, we are finding great variation in the validity of segments from different data partners, so you need to know, not assume. Validate marketing ROI. You will want to run a series of A/B tests to verify that you are getting superior return from advertising via Amazon. You’ll want to go a level deeper and evaluate on-site vs. offsite effectiveness, display vs. search, vs. video, etc. Fast forward 3 years…let’s say your main digital media partners are Facebook, Google/Youtube, Amazon, Walmart, and programmatic across the open web. You are targeting different sets of proprietary shopper and intender segments with each. Your agency will NOT be able to measure reach or effectiveness across these publishers because of walled garden restrictions (made more severe by GDPR). Top down, reach-first media planning (the ‘ocean’ approach) will break down. Now what? Here’s the real sea change…your media strategy will need to become a waterfall, where you set priority order for ad spending and then move to the next priority when you saturate. I actually have been advocating this for years as it can double marketing ROI. Priorities will be defined by targetable segments, publishers, whether someone is close to an upcoming purchase, creative unit, etc. For example, for CPG, targeting your heavy (1/3) users when they are close to a purchase is proven to deliver 15 TIMES the return on ad spend, but you can only spend so much against that group before you need to waterfall down to the next group. Analytically, to best allocate marketing spending, realize that productivity results will come in pieces. You will need to integrate learnings from A/B testing, some from Multi-touch Attribution (MTA) and some from marketing mix modeling (MMM) into a cohesive media planning and execution platform. Both retailers and marketers want this. According to Ycharts, profit margins for Walmart and Kroger are in the 1.5-2% range and will want a line of business that shows profit margins like Facebook and Google…30-40%. Marketers will find they could double their marketing ROI by a RaM-based waterfall media strategy. Is there any doubt where this is headed? Copyright © 2013 Rubinson Partners, Inc.